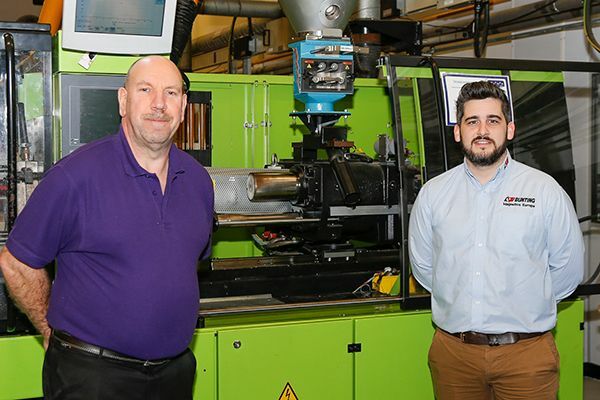 The Polymer Training & Innovation Centre in Telford has added a Bunting Magnetics Drawer Filter Magnet to the range of equipment at their plastics manufacturing training facility. The FF Drawer Filter Magnet attracts and captures any fine and coarse magnetically susceptible materials that enter the plastics manufacturing process. The Polymer Training & Innovation Centre provides polymer training and consultancy, specialising in injection moulding, blow moulding and extrusion training. They are a technical training and consultancy business that is owned by City of Wolverhampton College. At their Telford training facility, the Polymer Training & Innovation Centre has working production-sized plastics manufacturing equipment for injection moulding, blow moulding, thermoforming, materials handling, and a wide range of other important ancillary equipment. Technical Trainer, Andrew Dermody, explained the importance of trainees having practical training on the equipment. The training facility at Telford was refurbished in early 2017 and Bunting supplied the FF Drawer Filter Magnet in March 2018. The FF Grate Magnet is bolted onto the bottom flange of a Summit Systems fed hopper. The Magnetic Separator has a transparent front plate so that operators are able to see the material passing through or held within the system. Virgin plastic beads fall from the hopper through two rows of high strength Tube Magnets, which attract and hold any magnetically susceptible materials. The Tube Magnets use ultra-strong, permanent, Neodymium Rare Earth Magnets. The cleaned plastic beads are then fed into the Engel injection moulding machine. Removing all metal contamination ensures that the final plastic product is free from defects and reduces the amount of waste and potential damage to moulding machines. On a regular frequency, dictated by the amount of metal captured, the Tube Magnets are removed as one complete assembly from the housing and cleaned. The design of the Drawer Filter Magnet means that removal of the Magnet Assembly is quick and easy, keeping maintenance times to a minimum. Bunting also supplied Drawer Filter Magnets for use in the classroom and the Polymer Training & Innovation Centre plan to incorporate ‘metal separation as one of the course topics. The Drawer Grate Magnet is widely regarded as standard for the plastics industry and Bunting has supplied thousands to plastics manufacturing operations globally. On the 18th April 2018, the Polymer Training & Innovation Centre is staging the Technivation event at their recently upgraded training facility in Telford. During the day there will be a series of short technical presentations, the opportunity to experience their Polymer on-line simulation software, and the chance to meet and talk with primary and secondary equipment suppliers including Bunting Magnetics. Visitors will be able to learn more about Polymer Apprenticeship’s and Funding and discuss their organisations own training requirements.